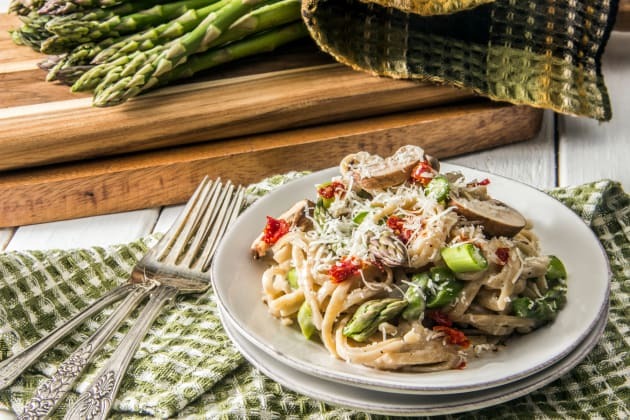 Creamy asparagus pasta makes us SO happy it's spring! The easy one-pot meal is absolutely delectable. 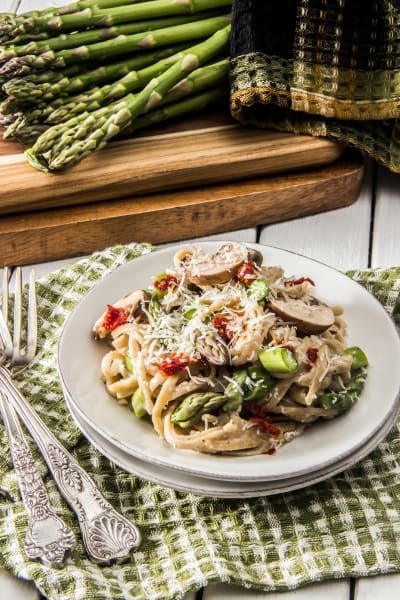 Considering all of the pasta recipes I’ve ever created, this creamy one pot asparagus pasta is one of my all-time favorites. 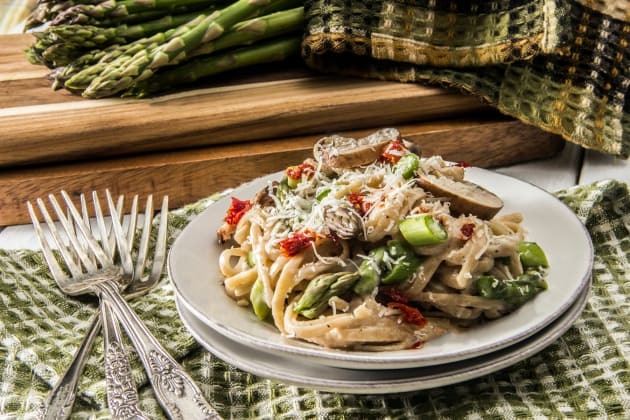 It’s healthy and packed with lots of nutrient-rich spring vegetables like asparagus and mushrooms. So this pasta happens to be light on calories (about 280 calories per serving) while also filled with detoxifying fiber (25% DV per serving) and skin-smoothing calcium (29% DV per serving) and vitamin A (15% DV per serving). But yet, at the same time, it tastes like the most flavorful, creamy, indulgent bowlful of pasta. One other big bonus? This pasta is cooked all in one pot, so it’s simple and quick to make (it’s ready in about 30 minutes), with an easy cleanup. 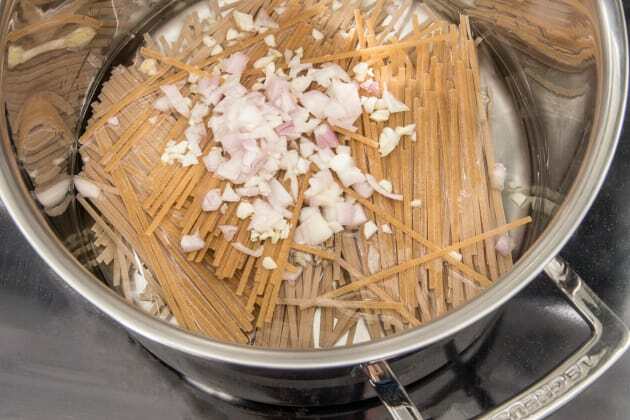 To begin, just toss plenty of whole wheat linguine into a big stockpot filled with three cups of water. Toss in a bit of minced garlic and chopped shallot, partially cover the pot, and bring the water to a boil. 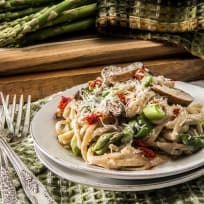 Then toss some freshly chopped asparagus and crimini mushrooms into the pot after most of the water is boiled away and the pasta is nearly tender. 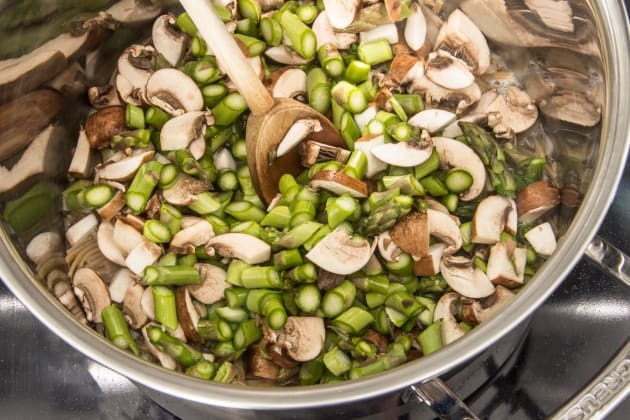 To keep the mushrooms fresh and tender and the asparagus crisp and vivid green, these spring veggies will only need a few minutes of cooking time. 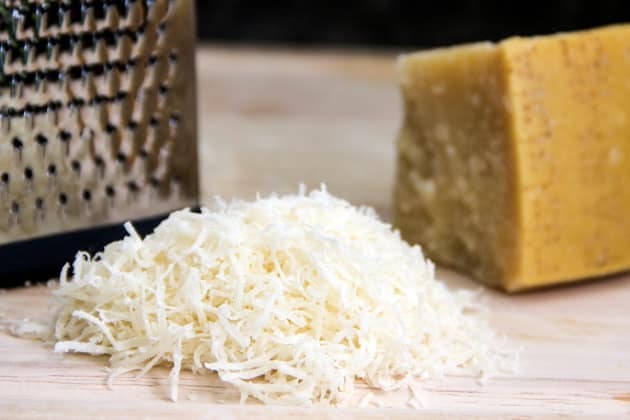 Next, the secret to plenty of creamy, rich, indulgent flavor: grate up plenty of real parmesan cheese! 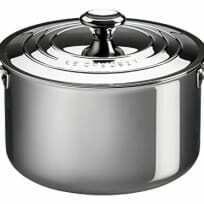 And, when the pasta is al dente and the water has all been absorbed, remove the pot from the heat and stir it in. 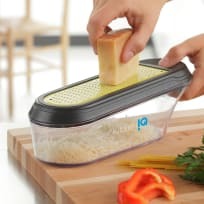 The warmth from the pasta will melt the cheese right in – delicious! Also add a bit of mascarpone (Italian cream). 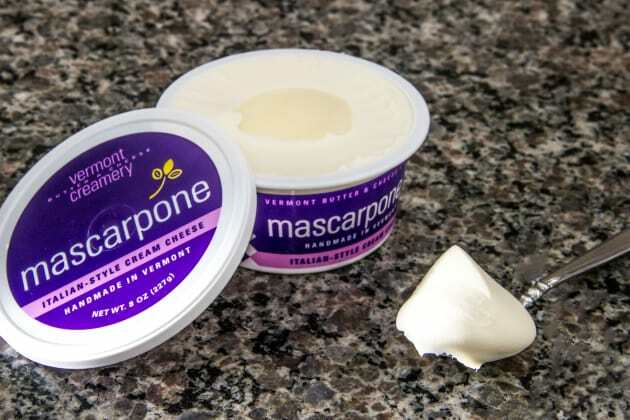 I love mascarpone because, as compared to, say, butter or cream cheese, it’s lighter in fat and calories. 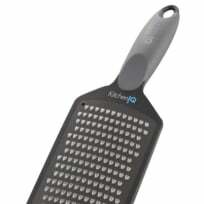 But yet a small dollop adds the most scrumptious, rich, creamy texture to the pasta. This pasta has the perfect combination of crisp, fresh spring asparagus and rich, creamy parmesan flavor. It’s nice to enjoy a generous helping of creamy pasta while at the same time knowing you’re eating something really fresh and nutritious too!